The mission of the Basin Management Approach is to foster stewardship of Mississippi’s water resources through collaborative watershed planning, education, protection, and restoration initiatives. 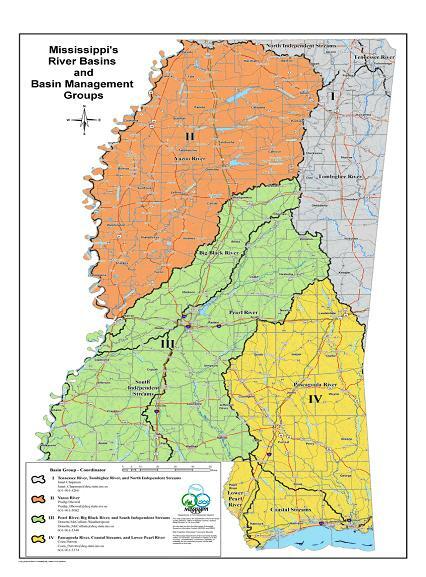 To accomplish this, nine of Mississippi’s major river basins have been organized into four basin groups (see map inset). Each basin group has a basin team of state and federal agencies and local organizations. This team provides the opportunity for multiple levels of government and local stakeholders to coordinate their efforts. Together, basin team members help assess water quality, determine causes and sources of problems, and prioritize watersheds for water quality restoration and protection activities. The Basin Management Approach also encourages and provides the opportunity for basin team members to pool both technical and financial resources to address priority watersheds. How Does the Basin Management Approach Benefit You? Identifies and targets our water quality problems and focuses efforts and funding on solving them. Provides more opportunities for direct involvement by you and other Mississippians in developing and implementing solutions to our water quality problems. Creates a more direct pathway for you and other basin stakeholders to access available technical assistance and funding resources. Lessens the need for future environmental regulation. Increases the likelihood of quality water resources for future generations. Successfully managing our water resources requires the input of all citizens in a basin – from homeowners to farmers to businesses to local officials. The Basin Management Approach provides opportunities for you to participate in decision-making efforts and in shaping the future of water quality in your basin. Remember, this is your basin. Take ownership of it and join the effort to protect its water resources. There are several ways you can participate in the Basin Management Approach. Participate in local stakeholder meetings. Join a local watershed group or start one of your own. Contact your Basin Coordinator about water quality concerns and how you can get involved.